If you are a flute teacher, a flute student, a self-employed musician, a self-entrepreneur, a promoter of your own chamber ensemble, or if you're just trying to figure out how to make your brain work well when you're practicing at home, or interacting with other musicians, I recommend two podcasts; they are both about how the human being's actual brain actually works! All of these brilliant audio episodes contain up-to-the-minute science on how our brains work and what we do with our little gray cells when we interact with each other in typical pecking-order or co-operative situations. All fascinating; all current; no firm answers (which might be good; stay flexible, ha ha! ), but lots of psychological avenues to investigate with experts giving opinions. The podcasts are fairly short (and you can do your chores while you listen!) and the audio is soft-spoken and well edited. This past summer these two shows represent some of the greatest hours I've ever spent listening to such brilliant ideas and insights about how to get back on track with your (weird but important flute) projects, how to deal with criticism and/or competition from the past, how to focus on your individual projects despite feeling lost about the point of them, how to prepare to be brave in public, how to deal with stressy colleagues who lean on you too much, etc. And I have never learned so much (while listening from home, actually knitting quite a few reams of yarn) about how we work as human beings, and then how to apply the newest psychological insights, when we're teaching or when want to co-operate as independent and democratic artists together. It's great to have these two podcasts as a resource! Scroll down when you arrive, and you'll see Load More, and keep going so that you can start right from the beginning of the podcast audio shows; you will find many episodes of interest, and there's much to learn in the earlier shows (especially with Akimbo by Godin). 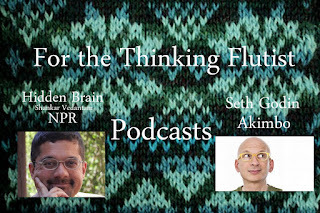 For flute students, the Akimbo early episode "No such thing (as writer's block)" is great; just change "writer's block" to "procrastinating on practicing flute".Akimbo by Godin. Scroll down to see more titles.